What do you really know about Mexican healthcare? In spite of my good health, I lived in fear in the U.S.
Like distant hoof beats thundering on the horizon, I would hear that perfectly healthy friends my age in Denver were paying over $600 a month for health insurance. One friend, who broke her elbow, is paying off $8,000 in related costs in addition to the $600 a month premium. Then there are those deductibles before the insurers will pay a dime, often at $5,000 a year. What good is health insurance if you get sick just thinking about it? In spite of the coverage, how many of us have any confidence that their insurer would cover the cost of one of those $100,000 a year cancer drugs if we needed it one day? My friends are the healthy ones. There are thousands of worse stories out there in our republic. Stories of financial ruin even among those who had health insurance when when they got sick. More than one half of all bankruptcies are caused by medical debt. Three quarters of those filing for bankruptcy have medical insurance when they become ill or injured. Loans to cover healthcare costs are not uncommon, meaning some are paying high insurance premiums and loan payments to stay alive. Sooner or later, we all get sick. Unless you have a million put away or are one of the disappearing breed of people whose health care is covered as part of a pension plan, whether or not health care expenditures will leave you destitute in your old age has become largely a crap-shoot. The U.S has the most expensive healthcare system in the world, and only to be ranked dead last among high-income nations, according to Newsweek. Experts believe that a healthy couple age 65 will need between $245,000 and $266,000 for health care costs to cover what will not be covered by Medicare. In an odd paradox, the healthier you are, the more money you need to have saved because you will live longer, have health care expenses longer, and be more likely to have more expensive end-of-life care. With trillions of dollars spent by a public inundated with advertising, fearful of alternatives, and anxious to find ready fixes, life expectancy in the United States ranks fiftieth among nations — and overall health indicators are no more flattering, placing it near the bottom of industrialized countries. Journalist Conor Lynch goes on to conclude that without a broad progressive movement that confronts the entire corporate state, healthcare will remain one of the many sectors corrupted by stock options and returns. As cases in point, drugs are two to six times more expensive on average in the U.S. than other countries, the most expensive in the world. The same impressive statistic is achieved in medical devices; hip and knee replacements and implants. According to The Economist, these high prices are unlikely to change. Pharmaceutical companies spend more on lobbying than any other industry, a quarter of a billion in 2015 alone. R&D doesn’t begin to explain the level of profit these companies are making. At least reforms in transparency, where hospitals would have to make their prices public and motivate people to compare (and rebel) are finally beginning to gain traction in progressive states. This won’t do anything about the gouging. I am still investigating healthcare options in Mexico. High quality health insurance with a private Mexican insurer will cost me about $200 a month if I buy in before I'm 62.
International health insurance companies also sell excellent expat policies. The last quote I received for an expat policy where I could be treated anywhere except the U.S. was about $450 a month and a very comprehensive program which even included experimental drug program eligibilty. Most drugs are cheaper, even much cheaper in Mexico. A visits with a pecialist costs a fraction of what you pay in the United States. Many doctors here received their training in the U.S. Many hospitals, particularly in major cities, are excellent. Routine tests cost a fraction of what they do in the States. Most expats I talk to are very happy with their level of care here, and some have very serious health issues. Online forums feature many expats who feel they receive better care here than at home. I hear stories from expats about how their Mexican doctors have out-performed their American doctors to a degree that they feel safer in Mexico. My own experience has been less (much less) than positive. Medicine in Mexico has a dark side when you're an American expat. While Mexico is not a dishonest culture, I would venture to say it can be an opportunistic one. My guess is that if a person is covered by insurance rather than paying out-of-pocket, has less the danger of being overcharged by virtue of being American. In general, I would say that if your treatment calls for more sophisticated, expensive technology, carefully examine the how a Mexican hospital will treat you versus an American one. The Mexican government's healthcare system and how they bill for it make sense, although their system is different in some ways. For example, for hospital stays, you may need to have a relative or friend bring your meals and take care of your personal needs. When you consider Mexicans' extended family networks, this makes perfect sense. Private insurance offers nursing care. Insurance deductibles are calcated on health event, rather than calendar year. Until I decide on a plan in Mexico, I will continue to hear the hoof beats. But at least I'm here now, close to determining how Mexico will fit into my game plan, and planning it while I'm healthy. I’m not standing stone-still on American soil waiting to be mowed down. 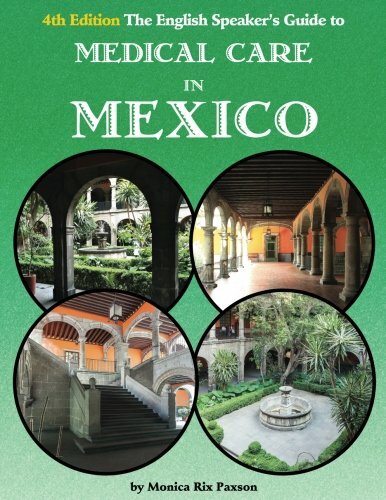 Monica Paxon's "The English Speaker's Guide to Medical Care in Mexico" will give you a good idea of what to expect, and how much less medical care will cost in Mexico. Next up: Technology makes living in Mexico totally different from what you remember from vacations 30 years ago. 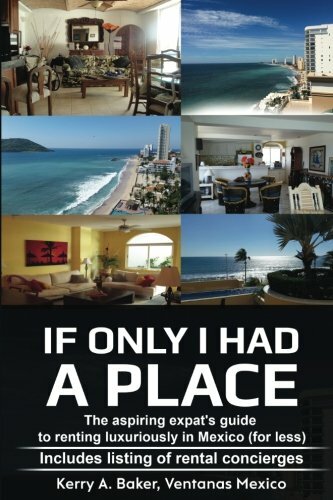 Kerry Baker is a partner with Ventanas Mexico which provides insight and resources to those considering expat life in Mexico including "If Only I Had a Place" a guide to renting in Mexico for the aspiring expat. More than a how-to, this book is a fluid system to rent well year after year. She is also author of the "Interactive Guide to Learning Spanish Free Online," a curation of the best Spanish language tools on the web. Get started learning Spanish for the health of your brain and for coming to Mexico.